KUALA LUMPUR, 11 Jun – Universiti Kebangsaan Malaysia (UKM) is truly a people’s university as its establishment was given widespread support by the people, said UKM’s Vice Chancellor , Professor Tan Sri Dato’ Dr Sharifah Hapsah Syed Hasan Sahabudin . Journalists and the media, especially the Malay newspapers, had played a part in this by advocating and giving wide coverage to the need of such a university that uses Bahasa Melayu as its medium of instruction, she said at the UKM-Media Night 2010 at the Le Meridien hotel here last night. She said that history showed that moves for such a university began in 1903 and gained momentum after independence. This historical connection makes UKM different from the other universities in the country, she said. Since then UKM has continued to be given good exposure by both the print and electronic media. Articles written by the universities lecturers had also been given space in the media. Analysis made by UKM showed that a total of 3,704 news and articles on UKM were published in 2009 of which 70 per cent were carried in the Malay language newspapers, 25 per cent in English language newspapers and five per cent in Chinese newspapers. In appreciation of such continued support by journalists and the media, UKM as from this year is giving awards to journalists who have written about UKM, its research and other activities. This is in addtion to the UKM’s Distinguished Journalist of the Year Award that was first given out last year. 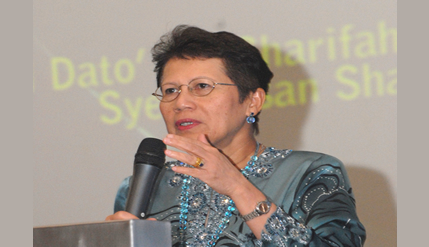 Prof Sharifah Hapsah said that UKM in its continuing efforts to disseminate information to the public especially its various research findings and other activities had established its own news portal launched together with its redesigned website inconjunction with its 40th anniversary celebrations on May 18. She hoped the news portal apart from disseminating its various activities to the public will also be a bridge between the media and UKM. The media is encouraged to visit the portal and pick up any news and pictures for publication. It can be accessed through www.ukm.my. She said that the strides made by the university showed that it has been successful in meeting its three main tasks of providing education, undertake research and be of service to the people. It has also proven that Malay is a language of knowledge having to date producing a total of 131,259 graduates. It has also been given recognition as a research university and had won the Prime Minister’s Quality Award. She said that UKM is now poised for its transformation to becoming a world renowned University by 2018. On the awards, she said the winners were selected by a panel of judges from UKM based on the published work and not through submission by the journalists. For the future the awards will also include items carried by Bernama and the electronic media. Winners were judged on the basis of the university’s eight research niche; Challenges of Nation Building, Regional sustainable development Renewable energy, Health Technology and Medicine, Climate Change, Nanotechnology and Advanced Material, Biodiversity for Biotechnology Development, and Content-Based Informatics. This year UKM also conferred its Distinguished Journalist of the Year 2010 Award to former Bernama General Manager and Editor-in-Chief Datuk Seri Azman Ujang. A book by last year’s UKM Dinstinguished Journalist of the Year awardee, Tan Sri Mazlan Nordin entitled “Tokoh dan Akhbar Melayu: Penebus Peminggiran Melayu” was also launched last night. The book is published by UKM Press. Datuk Seri Azman said he very much valued the award especially since it came from UKM, a university known for producing its fair share of graduates in journalism who continue to contribute to the development of the country’s media in their various capacities. He believed that UKM will continue to play its part in the development of the country’s media with continuing improvements to its journalism programme to produce graduates of calibre and with high creativity that meet the industry needs.